A Buxton man, a Wells woman and two North Berwick residents died in the head-on collision Saturday, police say. A Buxton man, a Wells woman and two North Berwick residents were identified Sunday night as the four people killed in a head-on collision Saturday in Berwick. Berwick police also released the names of the four other people injured in the crash on Route 4. The fatal crash took place around 1:30 p.m. Saturday. The release of the names was delayed because Berwick police had difficulty contacting some of the victims’ relatives to notify them. In a statement issued shortly before 9 p.m. Sunday, Sgt. Jeffery Pilkington identified the driver of a 1994 Honda Civic that made an “improper pass” just before the crash as Robert Howard, 31, of Buxton. The improper pass caused Howard to lose control of his car, which “slid into the path” of a sport utility vehicle, police said. Howard and two of his passengers died at the crash scene. They were Kevin Clark, 29, of Davin Clark, 7, both of North Berwick. A fourth occupant of the Honda Civic, K-La Scott, 22, of Gorham, suffered serious but not life-threatening injuries, Pilkington said. Howard’s car collided with a 2014 Ford Explorer driven by Hope Stamps, 46, of Woburn, Massachusetts. Barbara Allen, 73, of Wells, a passenger in the Explorer, was taken to Wentworth-Douglass Hospital in Dover, New Hampshire, where she died. Two other passengers in the Explorer – Eurie Stamps, 49, and Shannon Stamps, 17, both of Woburn – sustained injuries that were not life-threatening, police said. The collision took place about a mile from the Links at Outlook golf course in Berwick, a small York County town located near the New Hampshire border. 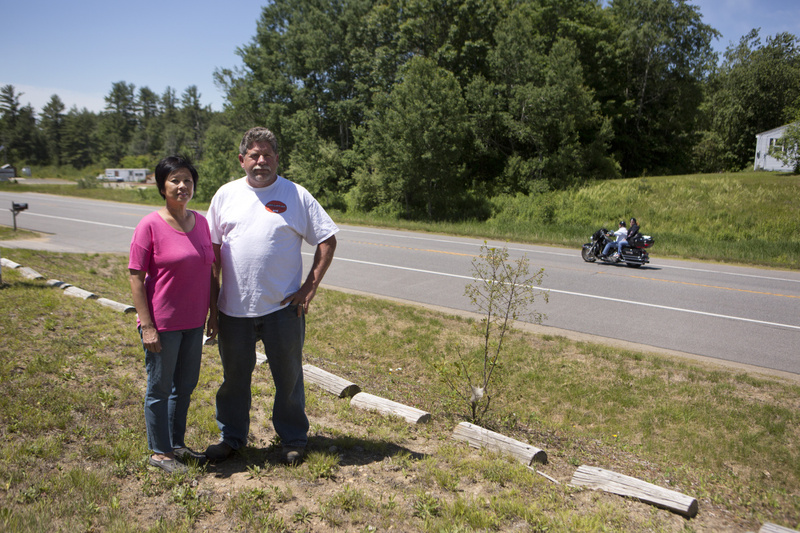 Mary and Chris Webber often watch the traffic go by on Route 4 in Berwick from the Berwick Bark Park, the dog park and food stand they own. “We have literally stood here and watched cars towing boats passing other cars. People just fly by,” he said. The crash was the deadliest in Maine in more than three years. 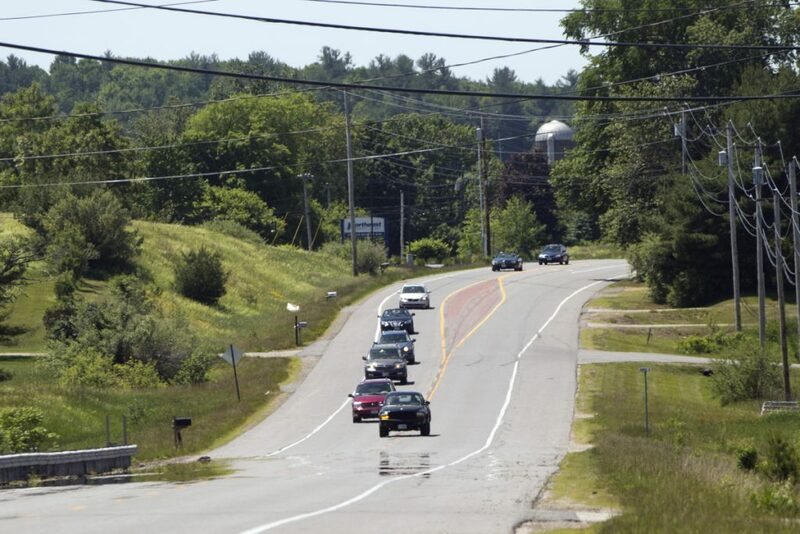 That stretch of Route 4, like many rural two-lane roads throughout Maine, is prone to serious accidents. Those who live and work near Saturday’s accident said in the past five years there have been at least three other fatal crashes on a milelong stretch between Childlight Montessori School and Salmon Falls Nursery and Landscaping. The road is straight, the posted speed limit is 55 mph, and passing is allowed along several stretches, which encourages a lot of risky driving, they said Sunday. Rear-end collisions are frequent as vehicles travel close together at high speeds. On Jan. 10, Jeremiah Smith, 31, of Sanford was killed when his car was rear-ended by an SUV and pushed into the path of an oncoming school bus. On Sept. 2, 2014, Stephen Mickle, 63, of Ayer, Massachusetts, was killed when his motorcycle rear-ended a car making a right turn into a driveway. On April 10, 2013, a local special education teacher was killed when an SUV driven by a 17-year-old boy crossed the centerline and struck her car. Amy Harris died instantly, police said. Her two children, then 7 and 4, were injured but survived. The teenager who caused the accident was not charged criminally, but Harris’ family later filed a wrongful death lawsuit. After that accident, a rumble strip was installed on the road, neighbors said. On Saturday, Tom Elliott felt the crash happen in front of his home at 428 Portland St., next to the Red School House day care center. “I was just coming out the door. You could feel it from the ground,” Elliott said Sunday. He looked up to see a horrifying scene, a red SUV crumpled against the guardrail and the white Honda sedan split in two. “I am glad the day care children were not here,” he said. Chris and Mary Webber said they see hair-raising behavior every day as they watch the traffic whiz by their concession stand at Berwick Bark Park at 410 Portland St.
“We have literally stood here and watched cars towing boats passing other cars. People just fly by,” Chris Webber said. Jamie Ricker of Ricker’s Mulch and More at 405 Portland St. said driving along Route 4 requires constant vigilance. “You have got to pay attention,” Ricker said. Webber said a prohibition on passing on Route 4 would probably help. All of those interviewed said part of the problem is the lack of a traffic light where Routes 4 and 236 intersect in South Berwick 2 miles away. On busy days the traffic backs all the way up to their homes and businesses. A 15-year-old girl was killed in an accident in Edgecomb on Friday afternoon that also injured her three passengers. A man died in a rollover in Brownfield, also Friday. And a motorcyclist was killed in a crash Saturday afternoon in Auburn. Maine State Police spokesman Stephen McCausland said the last time four people were killed in a motor vehicle accident in Maine was in March 2015 in the Aroostook County town of Stockholm. A car and an SUV collided on a snow-covered stretch of Route 161 north of Caribou, killing four and seriously injuring another person. Icy roads also were a factor in a two-vehicle accident that killed six young adults in Poland during Christmas weekend in 2006.